To our neighbors across the ocean, lunch in American schools is evidence of our culinary inferiority. The fact that one third of the nation’s children are growing up overweight and obese leads many to point a finger at school food. But in reality, the age of sloppy joes and tater tots is steadily giving way to salad bars, sweet potato fries, and vegetable chili. Major changes and healthier regulations for school meals that began in 2014 have shifted the menu toward whole grains, less sugar, less sodium, and more vegetables and fruit. In fact, school meals are a vital part of a federal child nutrition strategy that provides healthy food to children and helps fight hunger and obesity. With the new emphasis on healthier meals, a wave of innovative efforts to add fresh, locally grown ingredients have emerged across the nation. These farm-to-school initiatives typically include school gardens, field trips to farms, nutrition education, as well as menus that feature seasonal flavors. In Connecticut, the Put Local on Your Tray pilot project (Tray Project) helps Connecticut school districts source, serve, and celebrate a different local food product each month. Led by UConn Extension in close partnership with the Connecticut State Department of Education, the Tray Project has developed promotional materials to support school districts willing to feature one locally grown and seasonal product each month. 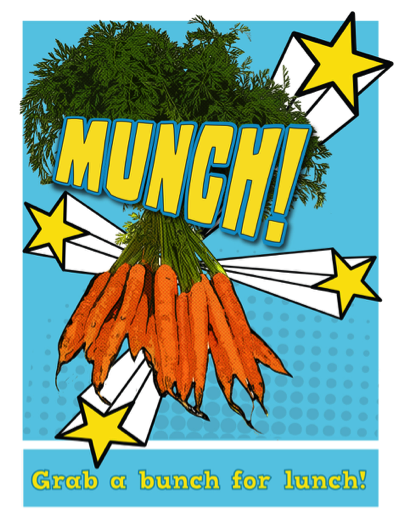 The Tray Project uses alluring and vibrant marketing materials including posters, stickers, and newsletter templates to educate the students about featured local foods. Using fun and engaging food puns such as “Kale, Yeah!—Don’t kale my vibe” or “Oh Snap!—I’m a Lean Green Bean Machine” have been key to generating a sense of fun and celebration around the new school lunch menu. The Tray Project assists participating school districts in building connections with local farms, sourcing local produce, and ensuring that cafeteria staff has what they need in order to process and serve fresh produce. “This program has proved to be an invaluable component of our educational efforts at Middletown Public Schools to connect our students to local farms and agriculture while promoting overall wellness to enhance and maximize student achievement,” states Ava McGlew, MS, RD, CD-N, Food Service Director Middletown Public Schools. Unlike similar ‘Harvest of the Month’ programs from other states, the Tray Project does not specify a month that each product should be used. This approach recognizes the true seasonality of produce young leaders for a year of paid public service building healthy school environments in limited resource communities. FoodCorps members build school gardens, teach nutrition and cooking, and help bring locally grown ingredients into the cafeteria. “When kids have an opportunity to learn and engage with fruits and vegetables in a positive way, they are much more likely to eat them. “in Connecticut (e.g. kale is available from August through December in our state) and gives more flexibility to the school food service director who is making decisions about when to purchase and use a featured local ingredient. Program Coordinator Dana Stevens and Outreach Coordinator Catherine Hallisey are currently working with four school districts including: Windham, East Hartford, Middletown, and Deep River. There are plans to expand to 15 districts for the 2016-2017 school year. Over 2,000 students have participated in an interactive component of the program known as Local Tray Days. The Tray Project works with school districts to select one date for a cafeteria taste-test using kid-friendly recipes, and a second date, when the sampled local item is incorporated into the menu. Recipes include cider-glazed squash, kale chips, berry blast smoothies, and squash apple bisque. “When kids have an opportunity to learn and engage with fruits and vegetables in a positive way, they are much more likely to eat them,” Dana explains. Students are asked to vote on what they thought of the local featured item. They can respond with one of the three options, tried it, liked it, or loved it. According to USDA, schools report that farm to school programs can increase the number of students purchasing school breakfast and lunch, improve consumption of healthier foods at school, and reduce plate waste. There are 187 school districts in Connecticut, and 74 percent completed the USDA Farm to School Census. Of those, 70 percent are currently participating in farm to school activities, and another 19 percent have plans to start in the future. Programs like Put Local on Your Trayare an easy way to bring more local foods into the cafeteria. By focusing on one local product each month, farmers can plan ahead to grow the food needed, and food service directors can build that local product into school menus. More local foods in schools results in more support for our farmers. This means more of our dollars stay in the community, and local economies are strengthened. The Tray Project is a component of UConn Extension’s outreach and education on sustainable food systems, led by Associate Extension Educator Jiff Martin.